Mr. Sullivan is now gathering information for his latest scholarly topic, American Musical Clocks made prior to 1830. 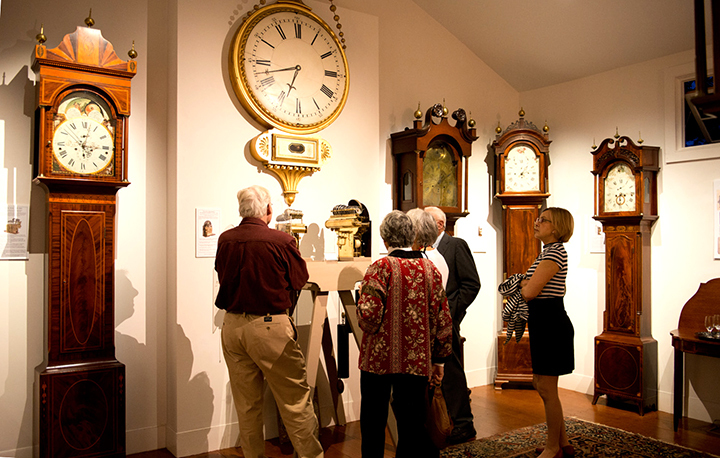 This project will document and illustrate all known examples of these rare and important antique clocks. Gary will collaborate with accomplished music historian Kate Van Winkle Keller, to produce a comprehensive full color catalogue demonstrating the significance of these extraordinary antique clocks. This study will culminate in an exhibit of American musical clocks to be held at the Willard House and Clock Museum in North Grafton, MA. At present information relating to, and examples of these rare clocks are being sought for inclusion in this important book. A number of these clocks have already been documented and are included in a pamphlet on Early American musical clocks previously published by Kate Van Winkle Keller in 1982. We are thrilled to be collaborating with her, thirty years after her initial study in order to expand our knowledge of this subject. 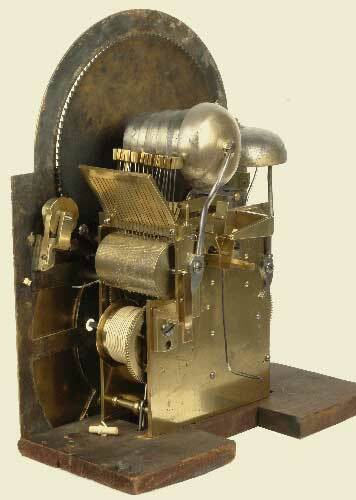 Please contact us with any information about pre 1830 American musical clocks for possible inclusion in this study. This important article written by Gary Sullivan and Brock Jobe reveals the identity of two of Plymouth county's fine cabinetmakers. The idiosyncrasies of their antique furniture have long been known, but until recently their identities were lost to history. This article was published in The Magazine Antiques in May of 2009 and followed closely the release of the text “Harbor & Home”, that was co-authored by Gary and Brock. These important discoveries were the end result of the comprehensive research performed for “Harbor & Home”. Follow the link to read the article. Mr. Sullivan is assisting independent scholar Mr. Paul J. Foley in his latest undertaking, to publish a history, catalog and guide of Simon Willard's antique lighthouse clocks. In conjunction with The Willard House and Clock Museum in North Grafton, Massachusetts, Gary is helping to locate privately held antique lighthouse clocks made by Simon Willard. In 2002, Mr. Foley published a very highly regarded, comprehensive guide to Simon Willard's antique patent time pieces. Information relating to, and examples of these antique clocks are being sought for an upcoming publication devoted to this important form. In addition to those clocks which were included in the museum's recent exhibition of Willard lighthouse clocks, the author wishes to include all known examples of these masterpieces. An essential reference for any student collector or dealer in early American clocks, furniture, antiques, or decoratvie arts. Written by the recognized expert on patent timepieces. Over 650 illustrations, 1000 detailed biographical listings and allied craftsman. The most comprehensive, accurate and up to date listing of early 19th Century New England pre-industrial clockmakers. A fantastic guide that should be in every library. This article on Southeastern Massachusetts antique dwarf clocks appeared in Antiques & Fine Art 9th Anniversary issue in the Winter of 2009. 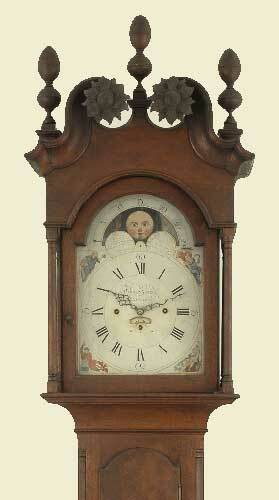 It discusses the rare dwarf clock form that was produced in Southeastern Massachusetts. The article is the result of the research Gary conducted for the text he co-authored "Harbor & Home". 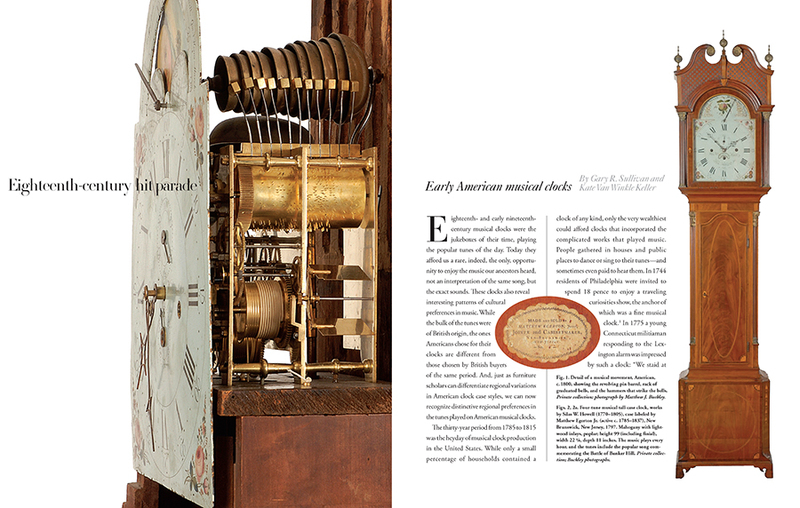 It describes the origins, makers and forms of the fascinating clocks. Read the article on antique dwarf clocks. This historically significant memorial was recently acquired by Mr. Sullivan. He has donated a photo realistic reproduction of the document for public display at the Willard House & Clock Museum, North Grafton, Mass. This Classically rendered watercolor memorial illustrates the family of celebrated clock maker Simon Willard of Roxbury, Massachusetts. Perhaps the best known of all American clock makers, Simon Willard was an innovator who changed the course of clock making with a number of major improvements such as the patent timepiece commonly referred to as the "Banjo Clock". The memorial illustrates the names and birth dates of Simon, his wife Mary and their eleven children. Included are two memorials to daughter Julia in 1799 and eldest son Thomas in 1810. Therefore the record would a have been created after 1810 but prior to 1823, the year that his wife Mary died. 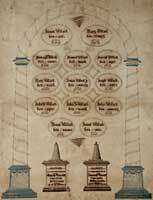 Although official records of Willard family genealogy are known, it is extraordinary to have discovered the personal record owned by the Willard household.